It’s a good idea to have everything prepped and ready to go! Mix the first 8 ingredients together until everything is incorporated and place in the refrigerator to keep cool. Sauté the onions until they become translucent and begin to caramelize. Line 12 of the wonton wrappers on a cutting board or clean surface. Set aside the remaining 12 wrappers to fasten on the top. Remove the cheese mixture from the refrigerator and mix in the caramelized onions. 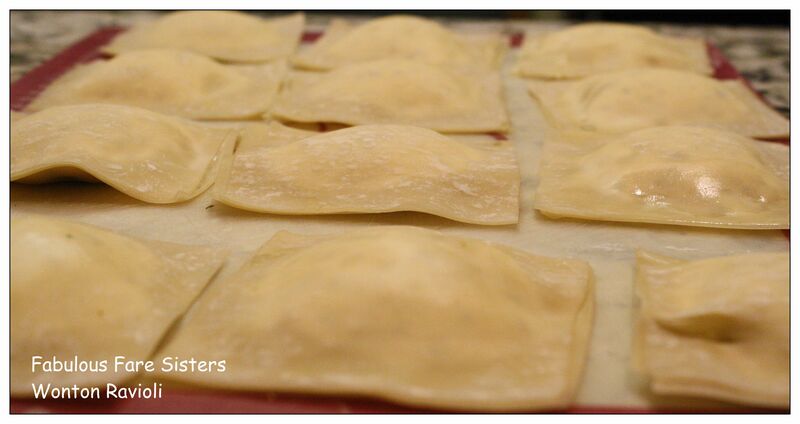 Place a dollop of cheese in the center of each wonton wrapper leaving an edge around the perimeter. With your finger run a little water around the edges one at a time and gently press each one with a second wonton wrapper on top; being careful not to press the cheese out of the sides. Press the edges together. Heat a shallow pan with salted water and bring to a boil. Add the ravioli three at a time and cook for 4-5 minutes. Remove with a slotted spatula and repeat until the ravioli are all cooked. Gently mix the herbs into the butter then on a piece of wax paper roll the butter into a log. Chill until butter becomes hard again. Slice into tablespoon size pieces and freeze for future use. In a small sauce pan heat the olive oil and cook the garlic. Finish with the herb butter and add the ravioli to the Aioli. I served this dish with a lightly breaded piece of cod. Delicious! It does look delicious Heidi! A generous helping (1/4 cup) of roasted garlic adds to any dish. I would include this recipe on my comfort food list. I agree, I LOVE roasted garlic! Thanks… Not hard at all.